Since 2004, San Francisco Symphony Media has produced various PBS, DVD, and BD releases including the Keeping Score series which combined both documentaries and live capture music performances profiling 8 different orchestral composers. 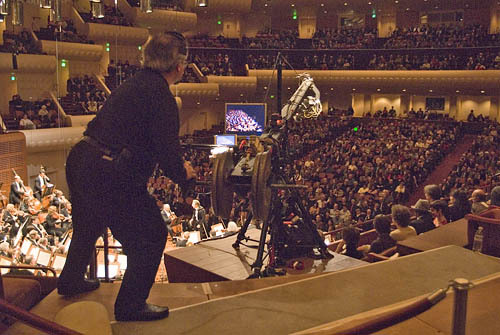 The following discussion highlights some of the common technical aspects of these live-capture productions by focusing on our most recent audio-for-video project - San Francisco Symphony at 100. We will look at both the development of the San Francisco Symphony’s audio capture techniques and the unique challenges facing those of us that typically produce audio-only releases in an audio-for-video context. Nothing that we've included in this overview is meant to advocate any particular technique, approach, or theory - it is merely a "how we did it" document. We're hoping that this article will prompt a few readers to actually watch/listen to the San Francisco Symphony at 100 DVD/BD live capture production and do so with a better understanding of the production process as it relates to the audio presentation. All Radio/Archive recordings must require no more than one operator for all aspects of the production. Stand mounted microphones cannot be placed downstage or in view of audience; any microphones on stage cannot interfere with logistical stage changes during concerts. All in-house recording work will fall under the jurisdiction of IATSE and applicable agreements. 1 day will be budgeted for the production of a complete, national syndication ready, final edited broadcast program including commentary and promotional materials. These requirements - specifically time, personnel, and microphone placement limitations - encouraged the development of a very efficient, cost effective (though somewhat compromised) capture system. And though this setup has evolved since 1988, we currently still deal with the access limitations of the attic (grid), down lighting, occasional hanging trusses, and the adjustable stage canopy & speaker cluster. 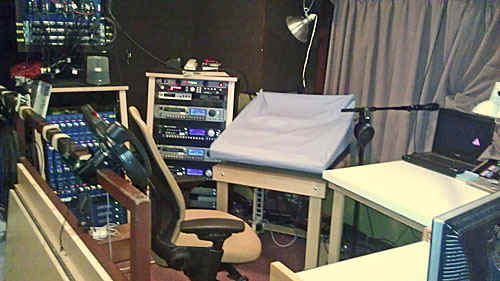 Because we developed both rigging and pickup techniques/solutions that are somewhat unique to our venue, the Radio/Archive recording setup provided an excellent starting point for working with and around the additional limitations and requirements created by high quality video capture productions. 3 - This is an example of normal down lights, canopy, and trusses with moveable lighting instruments. Although difficult to see, we manage to get microphones threaded through this jigsaw puzzle with adequate safety clearances. 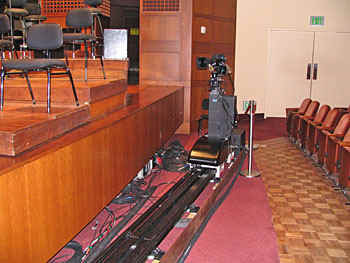 1) Since video capture of concerts/special-calls typically overlap and/or are staggered around Radio/Archive audio-only concerts/recordings, we needed to create a modified microphone arrangement that could quickly revert back and forth between the two; the available time and personnel to execute significant technical/logistical changes, on average, is very limited. Because of these challenges, it was not possible to consider radically different alternating setups. 2) Because more lighting equipment is flown above the stage for video production, safety considerations require, again, that temporary hanging microphones/breasting lines cannot interfere or make contact with special purpose video lighting trusses or motorized lighting instruments. 3) Microphone positions must allow for primary camera angles as anticipated from director's plan view. 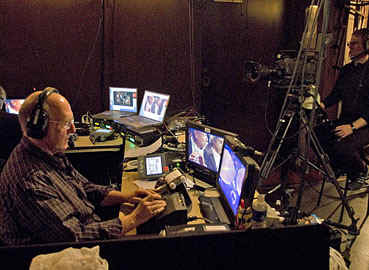 4) Microphones and cabling cannot interfere with moving cameras, on-stage video crew movements, or robot tracks. 7 - A camera crane operator during performance. 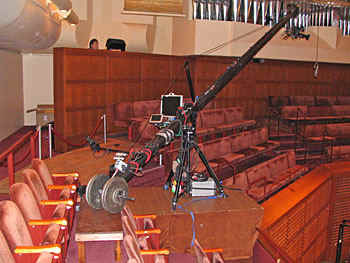 Although both tall stand and hanging mics have been adjusted for tight jib clearance, the operator must still negotiate a difficult obstacle course. 5) Microphones - both stand mounted and hanging - must allow appropriate clearance for crane/jib moves and vertical telescoping cameras. 6) Although every effort is made to dampen noise from robots and motorized lighting instruments, microphone placement must not exaggerate their presence; any section or overall microphone locations might be susceptible to this leakage. 8 - One of the robot cameras during a "Card" rehearsal. 7) Any stand microphones need to be as visually inconspicuous as possible; they also need to be easily movable to accommodate non-recording stage activity during the live performances. 8) The audio crew can generally expand as follows for recording with cameras (& truck): audio director (producer), 2 x A2 (assistant), and machine/multi-track operator. For comparison, audio-only SACD productions expand as follows: producer, 1 x A2, and machine/multi-track operator. And of course, Radio/Archive recordings require one operator. Again, since most of what is recorded is sourced from life performances, there is a significant possibility that stage moves that are totally unrelated to the recording will need to be made to accommodate the setup of other works on the program. This can dramatically impact the recording personnel requirements on stage as microphone moves between pieces during the live concert may be unavoidable. If we look at the generalized, overhead plan view for both layouts, one might immediately notice that the amount of stand microphones are quite different; the audio-for-video layout uses many more. The primary reason for this is that all audio-for-video productions are multi-tracked for better control of musical balance with picture. The secondary reason is that stand mics often replace hanging microphones so that certain camera shots/angles, crane and vertically telescoping camera moves are unobstructed. Simply put, the audio-for-video microphone layout has greater flexibility without changing most of the basic, important pickup parameters. Regardless the differences in stand microphone count, the overall pickup design is based on four spaced, breasted and angled, Main omnidirectional microphones. Because of the aforementioned canopy/speaker cluster restrictions, the distance between these hanging microphones is approximately 7.5'; their height above the deck is around 9'. This spread is not typical for arrangements without a center microphone. For example, the downstage microphones in a Decca tree are likely to be spaced less that 7.5'. 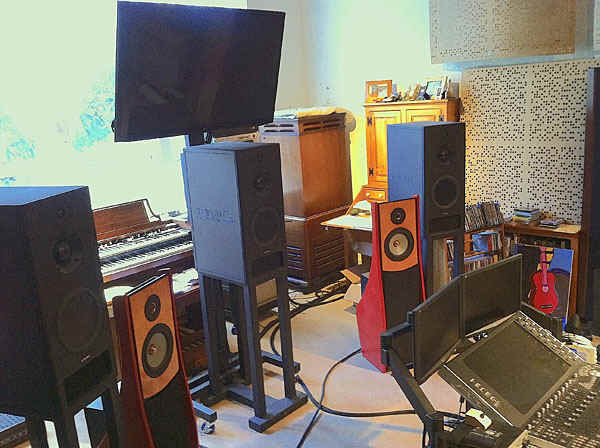 However, after many years of experimentation, we feel our current Main array produces a useful combination of flexibility, timbral accuracy, and musically appropriate balance for most standard symphonic concert literature. Moving upstage on either microphone layout, we see hanging mics for both the Violin 2 & Viola sections. These dead hung microphones are around 8' above the deck and, because they are not very close to their "targets", do not significantly discriminate against surrounding leakage. They do, however, pick up enough of their section/area to give some balance options. And even though the locations and technique are dissimilar, these microphones in effect somewhat replace the "missing" center Main microphone that one might use in a tree. 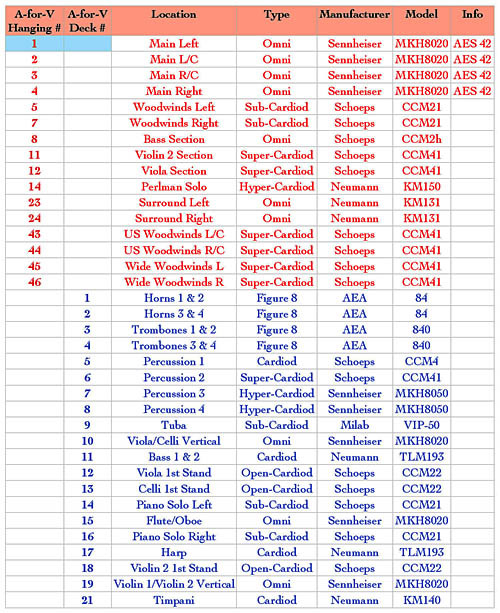 Looking at the woodwind section, we now see some differences - the Standard audio-only layout uses three dead hung microphones; the audio-for-video layout uses six. Looking at the Director's Camera Location plot for the Britten Young Person's Guide to the Orchestra in Figure 4 may help us understand some of the differences. Camera 6 is the conductor's camera meaning that the majority of all facial reaction/upper body shots of Michael Tilson Thomas are captured from this one position - our center woodwind microphone in the Standard audio-only layout didn't have a chance of remaining in place. So the solution was to "split" the center microphone pickup to clear this terrace shot. Additionally, we generally drop in an additional wide pair of microphones for a large section of woodwinds. For example, the Keeping Score Stravinsky live capture also used this wide pair of microphones to help cover the extremely large woodwind section used in those performances; the Keeping Score Beethoven Symphony No.3, however, did not. a) Musical blend can often be very good. b) Musical presentation can often have a more honest balance (though not necessarily always "good"). which tends to be very close, tight, and quick. a) Depending on literature, imaging can be weak. b) Audio balance may have weak specificity due to lack of fine balance control. c) Depending on literature, audio illusion of depth can be weak. d) Upstage dead hung (not breasted or angled) microphones can exaggerate certain woodwind harmonics. e) Depending on literature, the main mics can be a bit too close to strings. 1) Since the vast majority of our productions originate from live performances that, in some cases, do not have repeat performances to "cover" technical issues, we identified potential points of failure that must be addressable by a single operator during live performances. 3) Although both the attic (grid) and stage analog cable runs can be as long as 300' to the Record Booth, it was decided that no remote electronics would be used as they could not be serviced during live performances recorded by a single operator. 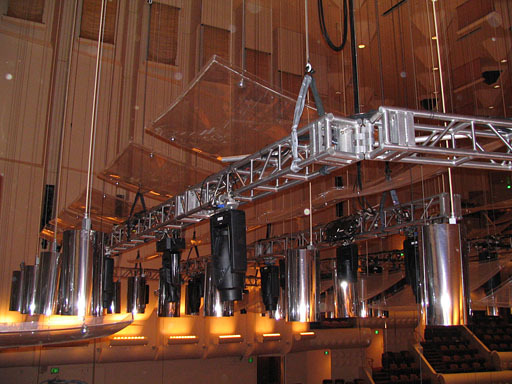 Such an installation would also need to be permanent and, since the concert hall venue has many non-symphonic events with specialized rigging/cabling coming and going, the chances of unintentional tampering or damage was considered another potential problem. 4) Referring to the list above in 2), it was decided that d) through f) would need to not only have redundancy, but that c) through f) would need to be modular for quick and easy replacement; c) through f) are all located in the SFS Record Booth. 5) After a couple of months of evaluations, we decided that running our 4 Main orchestral microphones digitally via the AES42 standard provided a significant increase in performance over the analog equivalent. The AES42 system also allowed the receivers to be located in the SFS Record Booth which meant we were still in compliance with the concerns articulated in 3). It's worth noting that we also ran comparison tests on analog microphone runs with line-level output preamplifiers placed at 10', 25', 40', 50', 75', and 300' intervals. Within the context of our microphone inventory (which generally utilizes low impedance, high output models), we did not feel that the differences when compared to the 300' total run were significant after the 40' interval. In other words, if we could place a preamp after the analog microphone at cable lengths of 40' or less, there was a significant qualitative benefit to justify doing so. But since our hanging microphones cannot actually address a preamp connection point at less than 75' (which includes both the trim and slack length in the attic), we agreed to live with the less than ideal results for everything other than the Main orchestral microphones. 6) After spending months recording and subsequently comparing microphone preamplifiers from various manufacturers, we have standardized on two products: 8 channels via a Millennia Media HV-3D and 40 channels via Forssell SMP-500s. The HV-3D is an single, 8 channel unit that does not comply with the modularity requirements of 4) above; the SMP-500s however, are modular, 500 series units and only require about 2 minutes to replace in the event of failure. The SMP500s also have redundant power supplies for their frames. 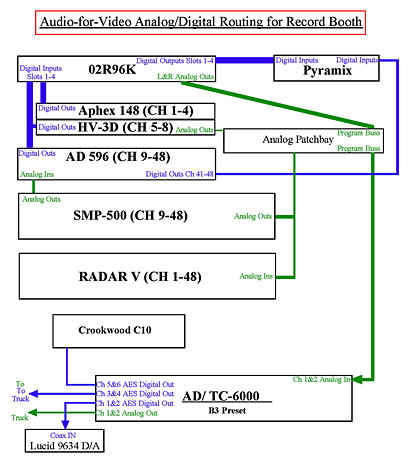 7) A/D conversion for the Merging Technologies Pyramix workstation is sourced from the Sennheiser MZD/Neumann DMI-2 AES42 combo for the Main microphones 1 through 4, the digital outputs of the Millennia HV-3D for microphones 4 through 8, and 5 Millennia AD596 A/D converters for all remaining microphone sources. The AD596 units are 8 channel, 500 series units that can be replaced in about 2 minutes in the event of failure. 8) The Radar V multi-track recorder has it's own internal A/D converters and provides a completely redundant, backup multi-track master should the Pyramix workstation develop any problems during capture. 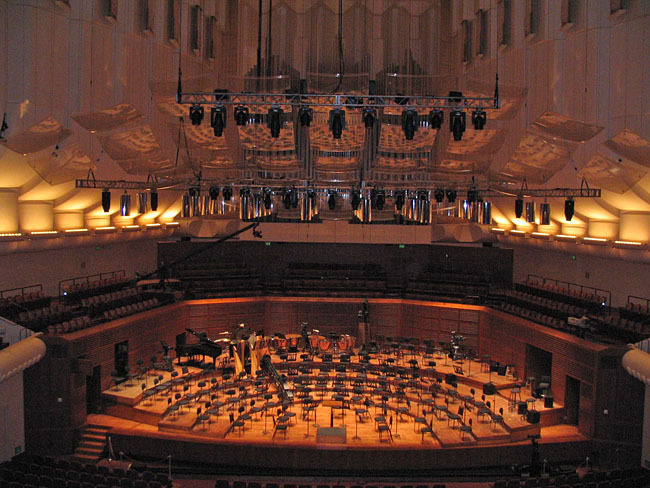 With the general exception of the microphones and cables that deliver their signals to the Record Booth, the San Francisco Symphony recording infrastructure is not only redundantly constructed but quickly and easily repairable during a live event. Assuming correct diagnostics, responding to and solving potential failures can be accomplished by one operator in an efficient, timely fashion. 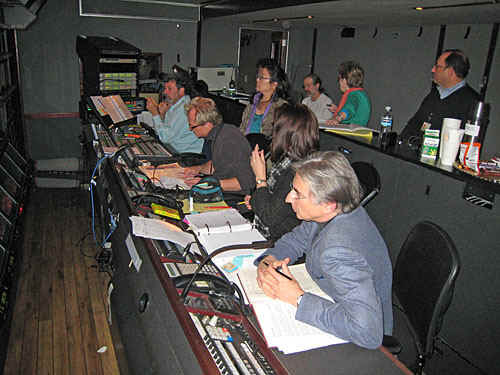 If there was a contest for recognizing the least attractive, least comfortable control room facility for the capture of performances by a major symphonic organization, our Record Booth would not likely be the winner; on the other hand, it probably wouldn't be selected for a glossy, industry magazine cover story either! It seems almost traditional that most concert halls built in the US thirty or more years ago never allocated appropriate space - let alone acoustically isolated construction - for the purpose of having a full featured recording facility. Our room does have a dedicated air conditioning system, though no effort was ever made to create a supply/return system that is either noise attenuated or speed controlled. We don't have access to any adjoining unused space for a machine room so computers, drives, etc. must be installed in IsoBoxes which do a good job minimizing acoustic noise (to a point). And although we have a terrific surround speaker system, the unsolved acoustic issues of the Record Booth greatly compromise performance. Finally, when we have an audio director/producer, multi-track operator, and invited guests in the Record Booth, we can barely fit 4 people comfortably!! 14B & 14C - Here are two more views of the San Francisco Symphony Record Booth where all the audio-for-video capture for the San Francisco Symphony at 100 and Keeping Score series occurred. 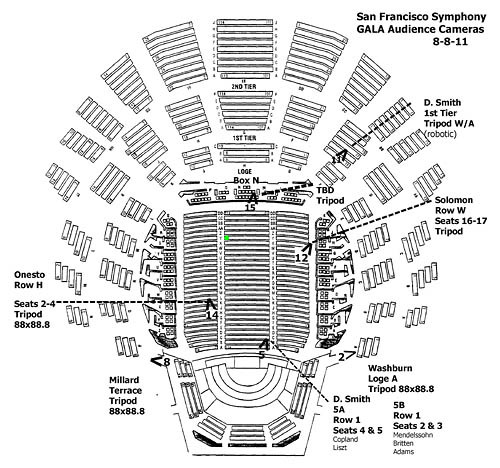 This room is also the point of capture for all San Francisco Symphony SACD productions starting in 2010. 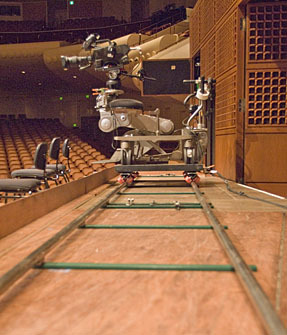 The San Francisco Symphony at 100 video production used a total of 18 cameras; at that count, the odds of having microphones in a shot can go up significantly. If we were to overlay a Director's Camera Location plot with either of the microphone layouts we've been discussing, one might think that the collision between camera angles/shots and microphones could be easily identified. In practice, probably 60% are obvious. It turns out that there is enough ambiguity in these Director Camera Layouts that make it difficult to precisely guess what each camera is going to be doing. For example, if we look at camera 2 in the Britten Young Person's Guide to the Orchestra Camera Layout in Figure 4, it's reasonable to assume that, because of it's terrace location, it will be responsible for picking up stage entrances/exits and bows. Although that turns out to be true and shouldn't cause any microphone issues, camera 2 is also going to try to get some solo woodwind shots which WILL have microphone issues!! 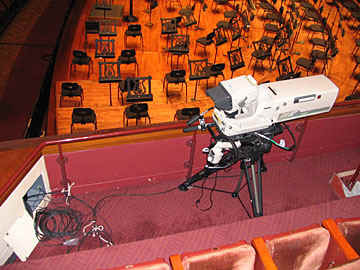 It is often the case that these fixed cameras do not have much positional flexibility in their designated locations as they are frequently in between seats/rows, crammed into tight stage areas, or confined to floor space where seating can be removed. As a result, a long shot once zoomed can very quickly find a microphone blocking a shot. With the exception of the 4 Main orchestral mics, we have to be prepared to consider moving any microphone that disrupts the shot if no other practical option is available. For another example, let's look at the plot for Audience Cameras in Figure 4 and locate Camera 8 on the stage left side of the terrace. That camera position was the only one that could capture many of the mallet instruments on the stage right side of the stage. Between that camera and the percussion is a lot of territory that included many hanging and stand mics. During the preliminary Card Rehearsal w/o orchestra, we had more than 4 microphones in those percussion shots. Ultimately, the solution was to actually move the entire percussion section 1 foot upstage rather than trying to change hanging microphone locations (which would have been remarkably difficult). BTW, a Card Rehearsal is a run-through of the programmed works with all the scripted camera moves but following a CD recording rather than the live orchestra. In many instances, this is the first viewing of the script/shots/lighting and allows implementing changes and corrections without having all the performers waiting around on stage. The term "Card" refers to the placards with instrumentation IDs positioned on music stands - they show where important players are located and help the video director and camera operators to refine shots and script. 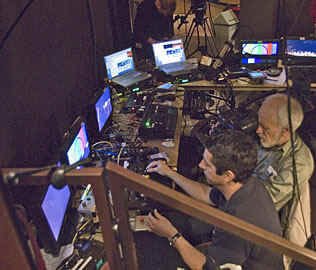 Ultimately, negotiating issues and solutions related to microphone/video conflicts typical rests between the video director and the audio director (producer). With over 9 major HD productions under our collective belts, it is my feeling that the audio director has to be as preemptive as possible regarding these problems so that the amount of last minute drama is minimized. Our audio crews try to study the camera locations and shot goals as early as possible in the production process. If we suspect potential issues, we talk to the individual camera operators BEFORE the video director views the shots; collaboration at that level before the constraints of time reduces flexibility is extremely important. Finally, the audio crew needs to be extremely sympathetic to the video goals in order to establish trust with the video director. If the video director doesn't feel that audio is on his/her side, you're likely to have a compromised experience. 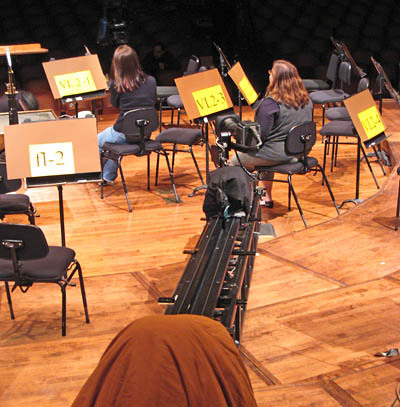 17 - Vertically telescoping camera between timpani and brass. As we've seen, the initial capture of San Francisco Symphony performances for both audio-only and audio-for-video productions can have similarities - it's in the area of audio/video post-production, however, where those methodologies can deviate the most. It has been historically the case that, in live concert video productions of the type we're discussing, most audio components generally conform to video. This means the video director edits primarily for the benefit of the picture content and the audio post-production personnel have to make this work no matter what is inherited. Performances that have great camera work, for example, can sometimes contain inferior musical elements. Without the consideration of picture (such as a SACD production), one can usually find other takes/versions to fix these musical execution problems. In the picture world however, we are constantly dealing with audio/video synchronization. In other words, one can't just substitute audio material that doesn't have a relationship to the video without having to consider the ramifications for synchronization. Assuming multiple performances, the audio director initially creates a multi-track editing roadmap that emphasizes the best musical performances/sections in as large as possible blocks. These large blocks are compared to the synchronized video material to make certain there are no insurmountable content issues for picture (important missed shots, etc.). 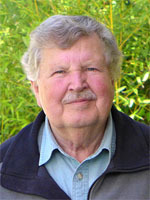 The audio director will create a reference list of problematic video issues for later use by the video director/editors. 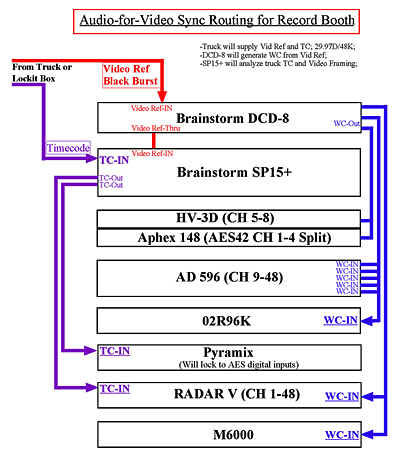 Following this general schematic, the audio director produces a more finely executed multi-track edit of this large block roadmap without altering any timing or video synchronization; this results in Audio Edit #1. After music director approval of Audio Edit #1, a CMX or equivalent video EDL (Edit Decision List) is generated from the initial large block roadmap in 1. and sent to the video director/editors along with stereo audio files representing the Audio Edit #1. An EDL, btw, is basically a reference list of all the audio segments used but organized via timecode locations that are shared by both the original audio and video capture materials. Now, if the audio director has done his/her job correctly, the picture elements that the video editors will assemble based on the delivered EDL will be synchronized to the Audio Edit #1. The video editors will further refine this initial picture edit using the supplied audio files as a reference for synchronization. Independently, the audio director will produce a further refined edit of the audio (without changing timing or synchronization) and create Audio Edit #2. After the final picture has been created by the video editors, the Audio Edit #2 multi-track will be ready for mixing to picture. Although the goal of creating a mix that works with and without picture is attractive for many reasons, it never seems to be aesthetically feasible - specially in the context of 18 or more HD cameras, many of which are providing extreme detail on individual performers and instruments. For example, hearing a beautifully blended clarinet solo that would be totally appropriate without picture can cause confusion when the picture implies a very upfront, present sound. What we try to do with the San Francisco Symphony video productions is establish a base, static mix that is a perpetual starting point for any adjustments made for either reasons of the general audio balance or picture content. Our virtual mixers are set up so that any non-core spot microphones have only a +/- 5 db range of fader adjustability. In most cases, this maximum gain range means that any adjustments will not likely be disruptive to the general imaging or balance of the base mix. Fader or level changes on specific spot microphones cannot be made suddenly. During a solo passage, for example, the video may initially focus on something else and then cut to a closeup. Regardless the picture sequence, the modified level of the solo needs to be massaged during the entire passage to be musically convincing. It is this nexus of reconciling what we're hearing and what we're seeing that presents a never ending source of wonderful challenges. When we finally feel we have a fairly solid mix, we listen to it without picture. The reason for this is that we're trying to determine whether we've gone too far with any adjustments that might be "masked" by the visual component. If we find areas that seem too aggressive, we'll review those areas again with picture to make certain that the adjustments are appropriate. 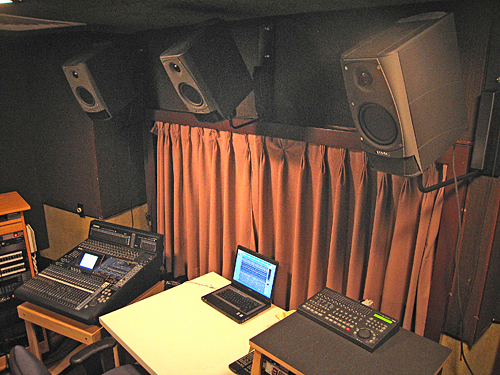 24 - The San Francisco Symphony audio-for-video post-production room. Our approach to the surround aspects of our video project mixes are very similar to our SACD releases. In 5.1 releases, 75% of the content of the surround channels is sourced from the Davies Hall surround microphones - see the Standard Audio-For-Video layout on Figure 10 for microphone locations. In 7.1 surround mixes, these same surround microphones constitute 100% of the side speaker feeds. As is probably the case for many others, we are trying to establish a more open and immersive experience. We're also trying to enhance the dynamic scaling by allowing the LF content of the hall to bloom more than it can in stereo. The microphones we use for surround are Neumann KM131s. These omnidirectional microphones are only flat on axis so their diffuse field response is rolled off; to our ears in Davies Hall, the roll-off begins around 3K. Additionally, these mics are dead hung with the capsule facing down and are trimmed at approximately the same height as the Main mics relative to the stage. What this location provides is a very well blended, slightly distant string/wind sound while at the same time (because of their trim height) discriminating against the typical compliment of upstage instruments. We find that, even though these microphones are only about 20' further into the house relative to the Main microphones, the pickup does not in any way emphasize higher harmonic structure that would tend to bring brass/percussion more forward in the eventual mix. It is very distracting to have bright, essentially direct sounding components of the deepest, upstage part of the recorded presentation sneaking their way into the surround channels!! Although it seems that surround production for orchestral music has been around long enough to have established some sense of standard goals and methods, one still gets the sense that it is a forever moving target with few practitioners feeling they've developed a reliable technique for all circumstances. It also seems that almost every hall must be approached as a unique challenge and that a real artistic consensus regarding the role of the venue contribution to the recording has yet to be found. Perhaps as a result of this confusion, we seem to field more questions about our surround techniques than any other aspect of our recording methodology!! Some instruments develop their sound over more distance than others. For example, in Davies Hall, the horns can often be well represented in either the Main or Surround microphones. There are times when the combination of the two pickups cause the horns to be overbalanced. If this happens, and it's musically appropriate to do so, we will reduce the surround field to maintain a better balance. In certain types of literature, we may want to enhance the effect of having more or less distance from the performers during specific passages. Gently adjusting the surround field can help provide that contrast. Should we have constant noise in the concert hall such as projection fans, we may lower the surround levels during extremely quiet passages so it is not too distracting. The San Francisco Symphony at 100 production had 9, extremely powerful projectors powered up during the entire concert which were used for generating the visual effects during the encore. Even though we reduced some of this noise with reNOVAtor, we still needed to lower the surrounds during certain quiet passages. Another popular question is "What surround implementation do we really prefer - 5.1 or 7.1 or ??" Even though it's currently only available with video content, our 7.1 presentations offer a superior listening experience. I believe this is due to better control and reproduction of the actual early reflections vs. the diffuse field in Davies Hall. As previously mentioned, the 7.1 mixes utilize the hanging surround microphones as exclusive sources for the side speakers. As a result, the presentation in 7.1 has more impact without any sacrifice in blend or coherence. Finally, the most repeated, #1 surround methodology question has to be "Do we add delay to any surround components??" The answer is yes. Depending on the literature and scale of the work, delays can be adjusted to broaden and/or deepen the sense of envelopment, reduce the perceived hall size for a more intimate experience, or simply just open up the reproduced acoustic enough to allow the music to breathe. The decisions on how to approach the quality and quantity of the surround field for any particular work are ultimately based on musical judgments, not technical ones. We do not try to create an experience that distorts or inappropriately emphasizes aspects of the music that is not consistent with our reading of the musical score. To that end, even though we record in the same venue for all our audio-only or audio-for-video productions, we've produced both surround recordings that have, what some might call, a very light enhancement and others that are surround field heftier. 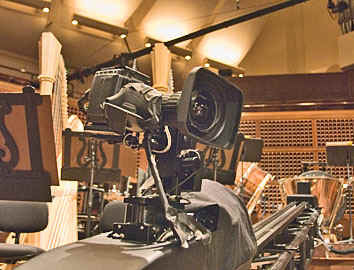 Since most of the captured material for San Francisco Symphony TV/DVD/BD productions is sourced from live performances in Davies Symphony Hall, we may inadvertently be capturing elements of the performance that are not generally referenced in the score; specifically we're talking about audience, lighting, stage movement, or other non-musical acoustic noises!! The software technology for reducing or removing undesirable noise is quite good now so we tend to not panic about the perfect musical moment being broadsided by audience/stage noise. 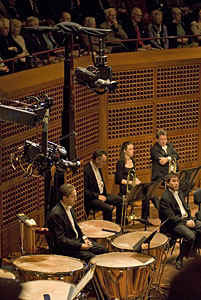 All San Francisco Symphony audio productions use reNOVAtor which is a product created by Algorithmix. reNOVAtor suits our production flow extremely well, can simultaneously "fix" 48 track, high sample rate material, and, if used sensibly, rarely produces artifacts. Typically, we perform all denoising on the Audio Edit #2 multi-track BEFORE mixing. Because of the large channel/microphone count on the multi-track, it's much easier to locate and identify the target elements that need to be removed. For example, if we were trying to remove audience noise from final stereo/5.1 mixes, we could have all sorts of sources/channels in those mixes that might obscure the reNOVAtor spectrogram. With the non-mixed multi-track sources however, we are likely to see everything we need in greater detail from, in this example, one of the surround microphones. On stage noises from stands, camera movements, robots, camera operator headsets, etc., can, by the same technique, be better isolated with the multi-track material since there is likely to be one close-enough-microphone that will produce a nicely detailed spectrogram; once the noise is properly visualized on a computer screen, it becomes much easier to extract it. The real art to denoising in our productions is to only extract what is needed to fool the ear. It takes time to develop the technique to not only identify the noise problem via the computer interface but to formulate an efficient approach for removal. There are many available interpolations in reNOVAtor and the operator needs to completely understand both the nature of the noise AND the musical context; any given moment in a musical work can "suggest" a different approach/interpolation for the same type of noise!! Of all the audio-for-video productions we've produced so far, the absolute, most remarkable feat of denoising was for the Keeping Score Copland DVD. The live capture work was Appalachian Spring in the original 13 instrument version. Since this was basically chamber music, all the camera, cable, and operator moves sounded like an avalanche of noise. At some moments, the operator headsets were louder than the music on stage!!! Even though that project took longer to denoise than most, it still represents a high water mark in the sensitive use of this type of post-production tool. When I was a lot younger trying to learn as much as I could about recording techniques and practices, it was somewhat frustrating that one could not find resources that would spell out the specifics regarding (first) LP and (later) CD releases from an audio production perspective. Why was it that I couldn't easily find out how the New York Philharmonic recorded a specific Mahler symphony or, better yet, why it sounded so much different than the same work recorded by another major orchestra?? Whatever the reasons, I'm not certain this situation has significantly improved. So one of the major reasons for constructing this basic overview of the San Francisco Symphony TV/DVD/BD audio methodology was to let others that are interested in these types of productions have the opportunity to possibly learn a bit from our experiences - both the successful and not so successful results. Nothing that we've included in this overview is meant to advocate any particular technique, approach, or theory - it is merely a "how we did it" document. 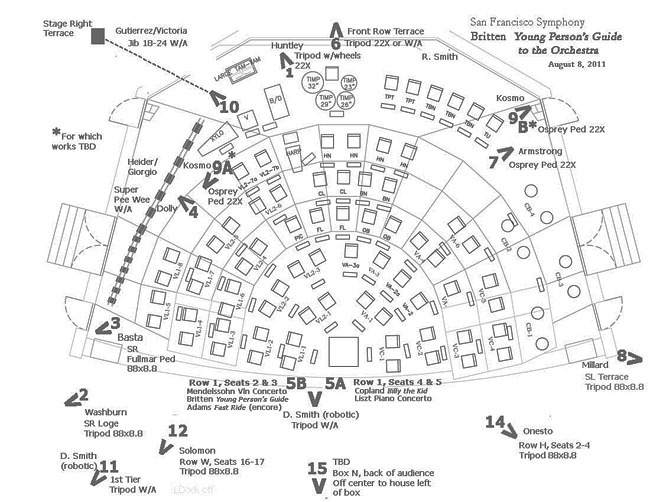 We're hoping that this article will prompt a few readers to actually watch/listen to the San Francisco Symphony at 100 DVD/BD live capture production and do so with a better understanding of the production process as it relates to the audio presentation. The Gala audio crew binder. Every audio person has a copy of this during the live recordings. These documents are also posted in the Record Booth, the off-stage right area, and the attic. This is an excerpt from the entire concert presentation available on DVD/BD. This work - Adams' Short Ride in a Fast Machine - is also available with another Adams work - Harmonielehre - on the Grammy winning SACD from SFS Media. This is a promotional video that actually shows a bit more microphone detail than any of the DVD/BD productions. This performance is available on SACD and digital download. This is a promotional video of performances available on SACD and digital download.